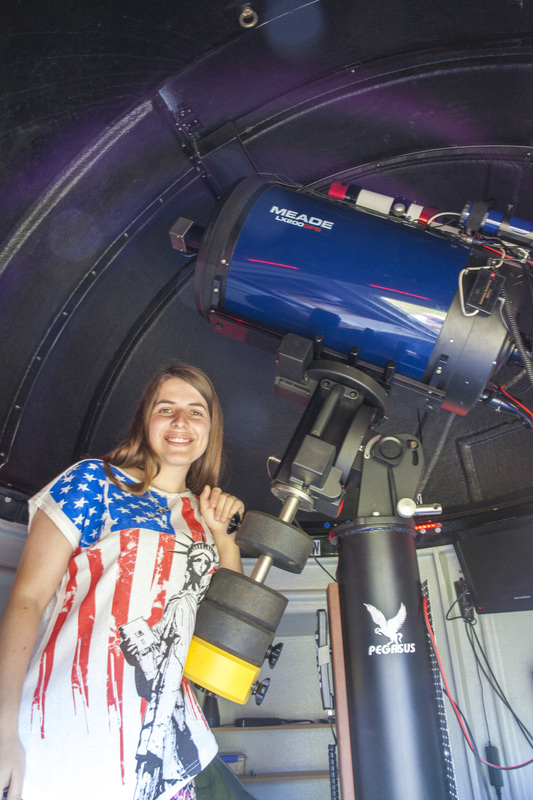 Samford Valley Observatory is recognised by the International Astronomical Union (IAU) as Q79. It is used largely for occultation observing but also serves on occasion as a useful tool for asteroid and comet astrometry (as well as the odd global broadcast!). It is a 14″ Meade SCT operating at f2 using Hyperstar and lives on top of on a Skywatcher EQ8 German Equatorial Mount. The camera is a dedicated and highly sensitive custom built video camera, TACOS_BD, created especially for occultation observing. The whole thing is set up for remote observing from my main residence which is not very remote at all being just 50 metres away! This is my guest Pranvera from Kosovo up there in the northern hemisphere adding scale to the scope. It’s a heavy thing needing 40 kg of counter weighs.